The Rio Earth Summit hangs in the balance. | "Global Possibilities"
Home » Activism » The Rio Earth Summit hangs in the balance. The Rio Earth Summit hangs in the balance. Dear friends,We know we’ve been asking a lot of you lately, but a proposal to end fossil fuel subsidies is hanging in the balance here at the Rio Earth Summit — and your voice could make a big impact in the next 48 hours.Right now, oil exporters like Venezuela and Saudi Arabia have succeeded in pushing forward a weak draft agreement that would do nothing to cut polluter handouts, which almost come to $1 trillion dollars. 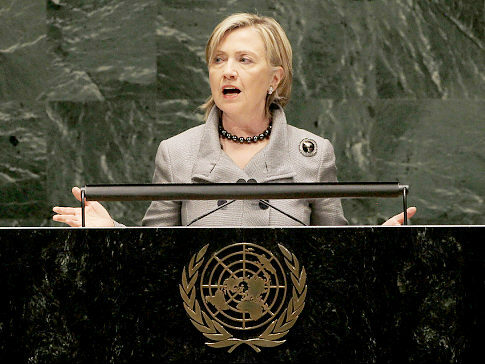 Secretary of State Hillary Clinton is arriving in Rio today and has the power to improve the text by adding a clear deadline to phase out fossil fuel subsidies by 2015. Thanks to Monday’s TwitterStorm, we now have the Obama Administration on the record supporting our call to action for Rio+20 — the White House and top Democrats like Nancy Pelosi all tweeted their commitment to #endfossilfuelsubsidies. In the last week, over a million people have signed petitions calling for an end to fossil fuel subsidies, and on Monday, our ‘Twitterstorm’ generated over 100,000 tweets to make this the top trending issue worldwide. Thanks to your tweeting, signing, and posting, we harnessed the power of the web and cut through the noise in Rio — and have made it clear to world leaders that ending fossil fuel subsidies has a clear public mandate. Make no mistake, the fossil fuel industry and their allies have already succeeded in mostly wrecking the Rio process — these meetings won’t come close to achieving the transformative agreements we need to save our environment and support sustainable development. But there’s still time to stick it to these corporate criminals and stop our money from funding their climate destruction.